Who needs subtlety when you have a T. rex? Start with Displaying the Tyrant King Part 1 and Part 2. Tyrannosaurus rex displays changed for good in the 1990s thanks to two individuals, one real and one fictional. 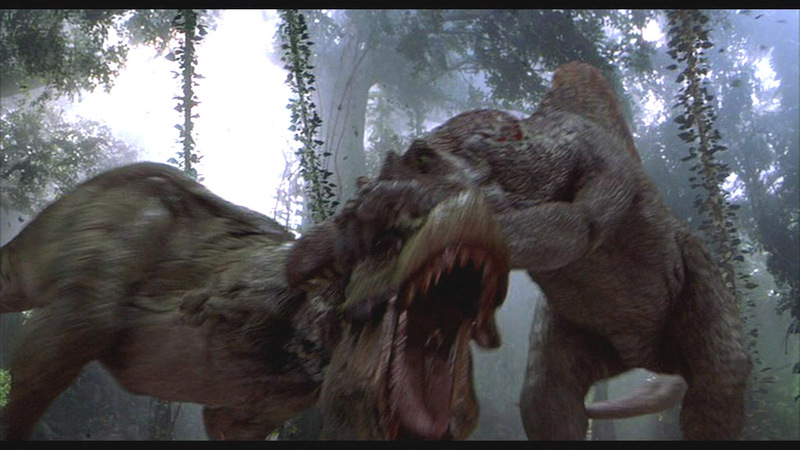 The latter was of course the T. rex from the film Jurassic Park, brought to life with a full-sized hydraulic puppet, game-changing computer animation, and the inspired use of a baby elephant’s screeching cry for the dinosaur’s roar. The film made T. rex real – a breathing, snorting, drooling animal unlike anything audiences had ever seen. Jurassic Park was a tough act to follow, and in one way or another, every subsequent museum display of the tyrant king has had to contend with the shadow cast by the film’s iconic star. The other dinosaur of the decade was Sue, who scarcely requires introduction. First and foremost, Sue is the most complete Tyrannosaurus ever found, with 80% of the skeleton intact. Approximately 28 years old at the time of her death, Sue is also the eldest T. rex known, as well as one of the largest. The specimen’s completeness and exquisite preservation has allowed paleontologists to ascertain an unprecedented amount of information about the lifestyle of meat-eating dinosaurs. In particular, Sue’s skeleton is riddled with fractured and arthritic bones, as well as evidence of gout and parasitic infection that together paint a dramatic picture of the rough-and-tumble world of the late Cretaceous. It was the events of Sue’s second life, however, that made her the fossil the world knows by name. Sue was discovered in the late summer of 1990 by avocational fossil hunter Susan Hendrickson (for whom the specimen is named) on the Cheyenne River reservation in South Dakota. Peter Larson of the Black Hills Institute, a commercial outfit that specializes in excavating, preparing, and exhibiting fossils, initially intended to display the Tyrannosaurus at a new facility in Hill City, but soon became embroiled in an ugly four-way legal battle with landowner Maurice Williams, the Cheyenne council, and the United States Department of the Interior. With little precedent for ownership disputes over fossils, it took until 1995 for the District Court to award Williams the skeleton. Williams soon announced that he would put Sue on the auction block, and paleontologists initially worried that the priceless specimen would disappear into the hands of a wealthy collector, or end up in a crass display at a Las Vegas casino. Those fears were put to rest in 1997 when Chicago’s Field Museum of Natural History won Sue with financial backing from McDonald’s and Disney. Including the auctioneer’s commission, the price was an astounding $8.36 million. FMNH and its corporate partners did not pay seven figures for Sue solely to learn about dinosaur pathology. Sue’s remarkable completeness would be a boon to scientists, but her star power was at least as important for the Museum. Sue was a blockbuster attraction that would bring visitors in the door, and her name and likeness could be marketed for additional earned income. As FMNH President John McCarter explained, “we do dinosaurs…so that we can do fish” (quoted in Fiffer 2000). 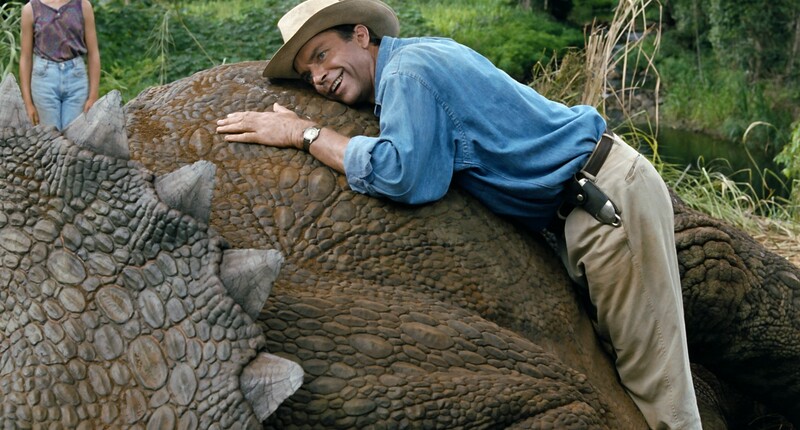 Particularly in the late 1990s, with Jurassic Park still fresh in people’s minds, a Tyrannosaurus would attract visitors and generate funds, which could in turn fund less sensational but equally important research, like ichthyology and entomology. 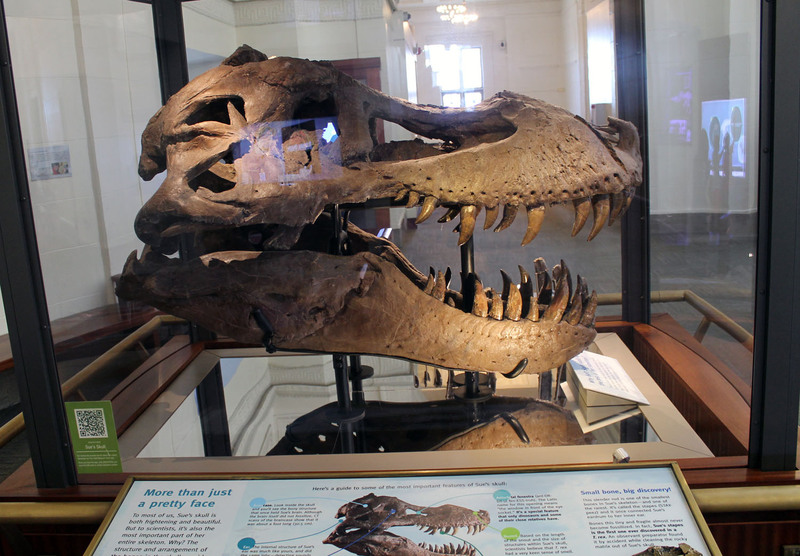 Original skull of Sue the T. rex, displayed on the upper mezzanine. Photo by the author. 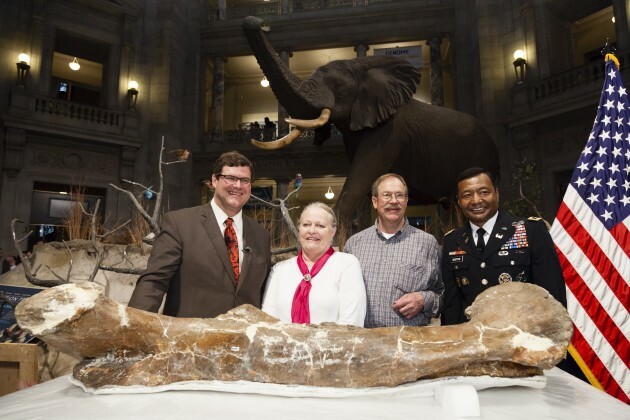 FMNH was under similar scrutiny as museum staff revealed their plans for Sue. The role of the corporate sponsors that paid for the fossils was a particular cause for concern, and the marketing team knew it. Although the idea of T. rex-themed Happy Meals was briefly on the table, McDonald’s and Disney wisely opted to present themselves only as patrons of science. McDonald’s got its name on the new fossil preparation lab at FMNH and Disney got a mounted cast of Sue to display at Walt Disney World, but the principal benefit to the two companies was high-profile exposure in association with youth science education. The Museum retained control over the message, highlighting Sue’s importance to paleontology and only coyly admitting her role as a promotional tool. Likewise, FMNH is the sole profiteer from the litany of shirts, hats, toys, mugs, and assorted trinkets bearing the Sue name and logo that are continually sold at the Museum and around Chicago. Once Sue arrived at FMNH, the Museum did not hold back marketing the dinosaur as a must-see attraction. A pair of Sue’s teeth went on display days after the auction, which expanded organically into the “Sue Uncrated” exhibit, where visitors could watch the plaster-wrapped bones being unpacked and inventoried. Meanwhile, McDonald’s prepared an educational packet on Sue that was distributed to 60,000 elementary schools. The main event, of course, was the mounted skeleton, which needed to be ready by the summer of 2000. This was an alarmingly short timetable, and the FMNH team had to hit the ground running. Much of Sue’s skeleton was still buried in rock and plaster. The bones needed to be prepared and stabilized before they could be studied, and they needed to be studied before they could be mounted. In addition, two complete Sue casts had to be fabricated: one for Disney World and one for a McDonald’s-sponsored traveling exhibit. The casts were produced by Research Casting International, the Toronto-based company that recently built the mounted menagerie for “Ultimate Dinosaurs“. Phil Fraley Productions, the same exhibit company that rebuilt the American Museum and Carnegie Museum T. rex mounts, was tapped to mount Sue’s original skeleton. The mounted skeleton of Sue in the Stanley Field Hall. Photo by the author. Unlike every other Tyrannosaurus mount before or since, Sue can hardly be called a composite. With the exception of a missing arm, left foot, a couple ribs, and small number of other odds and ends, the mounted Sue skeleton is composed of real fossils from a single individual. FMNH public relations latched onto this fact, emphasizing in press releases that while “many museums are displaying replicas of dinosaur skeletons, the Field Museum has strengthened its commitment to authenticity. This is Sue.” Just as they did with the AMNH Tyrannosaurus, Fraley’s team built an armature with individual brackets securing each bone, allowing them to be removed with relative ease for research and conservation. No bolts were drilled into the bones and no permanent glue was applied, ensuring that the fossils incur only minimal damage for the sake of the exhibit. Despite these improvements over historic mount-making techniques, however, the Sue mount does have some inexplicable anatomical errors. The coracoids should be almost touching in the middle of the chest, but the shoulder girdles are mounted so high on the rib cage that there is a substantial space between them. Consequently, the furcula (wishbone) is also positioned incorrectly. 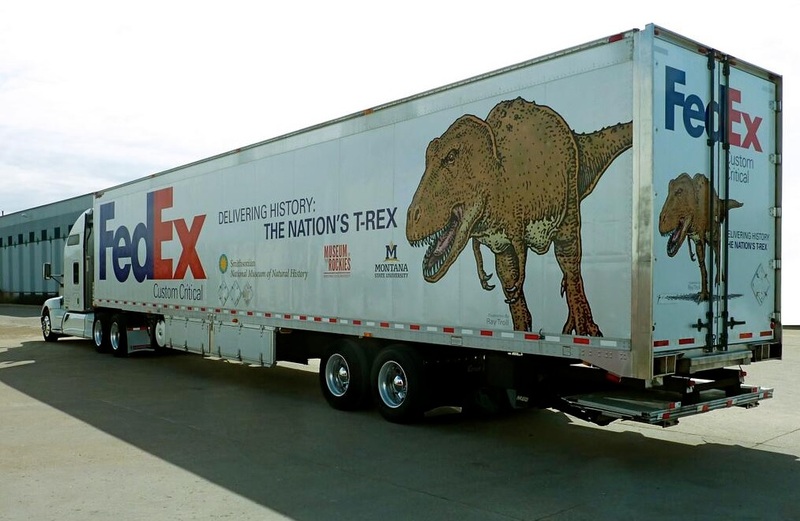 This customized truck transported the Nation’s T. rex from Montana to Washington, DC. This year, another Tyrannosaurus specimen has rocketed to Sue-like levels of notoriety. MOR 555, also known as “Wankel Rex”, is being transferred to the Smithsonian National Museum of Natural History, where it will eventually be mounted for long-term display. Now dubbed “the Nation’s T. rex“, the promotion of this specimen has mirrored that of Sue in many ways. Front-page media coverage, first-person tweets from the dinosaur and even an official song and dance contest herald the arrival of the fossils from their previous repository, the Museum of the Rockies in Montana. Much like the “Sue Uncrated” exhibit, the process of unpacking the unarticulated bones will soon be on view in a temporary display called “The Rex Room.” Meanwhile, the very name “Nation’s T. rex” is a provocative invented identity akin to Sue’s new status as a Chicagoan. Nevertheless, the Nation’s T. rex does not quite live up to Sue’s mystique. This Tyrannosaurus is neither as large nor as complete as Sue, and there was no prolonged legal battle or frantic auction in its past. The 60% complete skeleton was found in 1988 by Montana rancher Kathy Wankel, on land owned by the US Army Corps of Engineers. The fossils are now on a 50 year loan from from the Corps to the Smithsonian, (presumably) a straightforward transfer between federal agencies. In addition, MOR 555 is by no means a new specimen. Several casts of the skeleton are already on display, including exhibits at the Royal Ontario Museum, the Museum of the Rockies, the Perot Museum of Nature and Science, and even the Google campus. 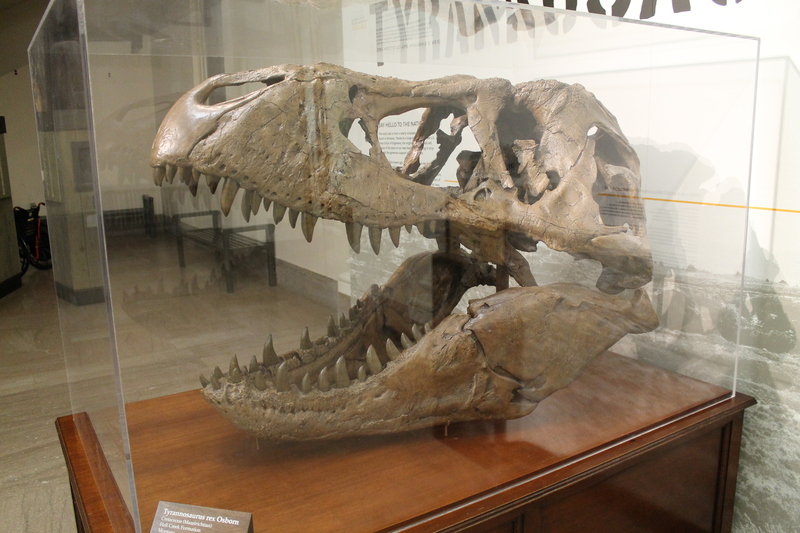 In fact, a cast of the MOR 555 skull has been on display at NMNH for years. 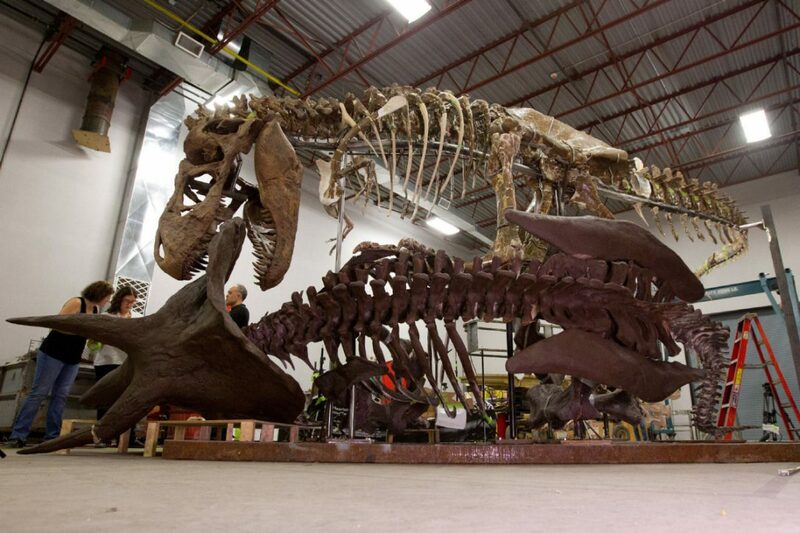 With that in mind, the hype around the Nation’s T. rex might seem like much ado about nothing. 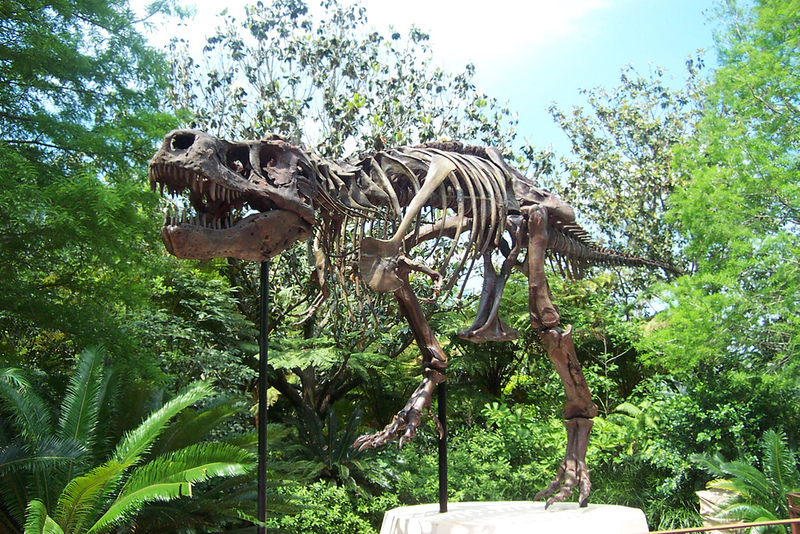 As this series has demonstrated, the number of Tyrannosaurus skeletons on exhibit, whether original fossils or casts, has exploded in recent years. A quarter century ago, New York and Pittsburgh were the only places where the world’s most famous dinosaur could be seen in person. Today, there may well be over a hundred Tyrannosaurus mounts worldwide, most of which are identical casts of a handful of specimens. Acquiring and displaying a T. rex is neither risky nor ambitious for a natural history museum. No audience research or focus groups are needed to know that the tyrant king will be a hit. And yet, excessive duplication of a sure thing might eventually lead to monotony and over-saturation. So far, such fears appear to be unfounded. A specimen like Sue or the Nation’s T. rex is ideal for museums because it is at once scientifically informative and irresistibly captivating. Museums do not need to choose between education and entertainment because a Tyrannosaurus skeleton effectively does both. And even as ever more lifelike dinosaurs grace film screens, museums are still the symbolic home of T. rex. The iconic image associated with Tyrannosaurus is that of a mounted skeleton in a grand museum hall, just as it was when the dinosaur was introduced to the world nearly a century ago. The tyrant king is an ambassador to science that unfailingly excites audiences about the natural world, and museums are lucky to have it. The Nation’s T. rex in its final pose at the Research Casting International workshop. This week, NMNH will be celebrating all things Tyrannosaurus, starting with a live webcast of arrival of the Nation’s T. rex on Tuesday morning. Stay tuned to this blog for further coverage of the events! Boas, F. 1907. Some Principles of Museum Administration. Science 25:650:931-933. Counts, C.M. 2009. Spectacular Design in Museum Exhibitions. Curator 52: 3: 273-289. Larson, N. 2008. “One Hundred Years of Tyrannosaurus rex: The Skeletons.” Tyrannosaurus rex: The Tyrant King. Larson, Peter and Carpenter, Kenneth, eds. Bloomington, IN: Indiana University Press. Rainger, R. 1991. An Agenda for Antiquity: Henry Fairfield Osborn and Vertebrate Paleontology at the American Museum of Natural History, 1980-1935. Tuscaloosa, AL: University of Alabama Press. Switek, B. 2013. My Beloved Brontosaurus: On the Road with Old Bones, New Science and our Favorite Dinosaurs. New York, NY: Scientific American/Farrar, Straus and Giroux. The original Tyrannosaurus rex mount at the American Museum of Natural History. Photo from Dingus 1996. Woodrow Wilson is in the white house. The first World War is raging in Europe, but the United States is not yet involved. The women’s suffrage movement is picking up speed. And you just heard that the skeleton of an actual dragon is on display at the American Museum of Natural History in New York. It is difficult to imagine a time before every man, woman, and child in the developed world knew the name Tyrannosaurus rex, but that world existed not even a century ago. In 1915, AMNH unveiled the very first mounted skeleton of the tyrant lizard king, immediately and irrevocably cementing the image of the towering reptilian carnivore in the popular psyche. Today, Tyrannosaurus is a celebrity among dinosaurs, appearing in every form of media imaginable. More importantly, however, it is an icon for paleontology and an ambassador to science. The cult of T. rex began in the halls of museums, and museums remain the prehistoric carnivore’s symbolic home. The mounted skeletons in museums provide the legendary T. rex its credibility: these are the authentic remains of the giant predator that once stalked North America. And yet, most of the dozens of Tyrannosaurus skeletons on display around the world are casts, and none of them represent complete skeletons (rather, they are filled in with spare parts from other specimens and the occasional sculpted bone). These are sculptures as well as scientific specimens, works of installation art composed by artists, engineers, and scientists. Herein lies the paradox presented by all fossil mounts: they are natural specimens and constructed objects, embodying a challenging duality between the realms of empiricism and imagination. A Tyrannosaurus mount is at once educational and spectacular. 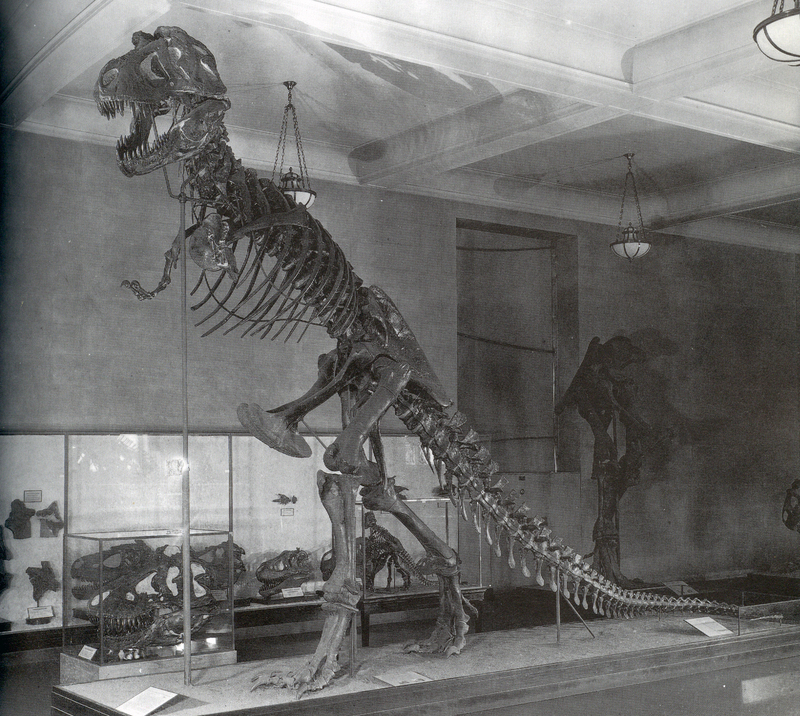 Both roles were embraced at AMNH in 1915, and these dual identities have defined T. rex displays ever since. 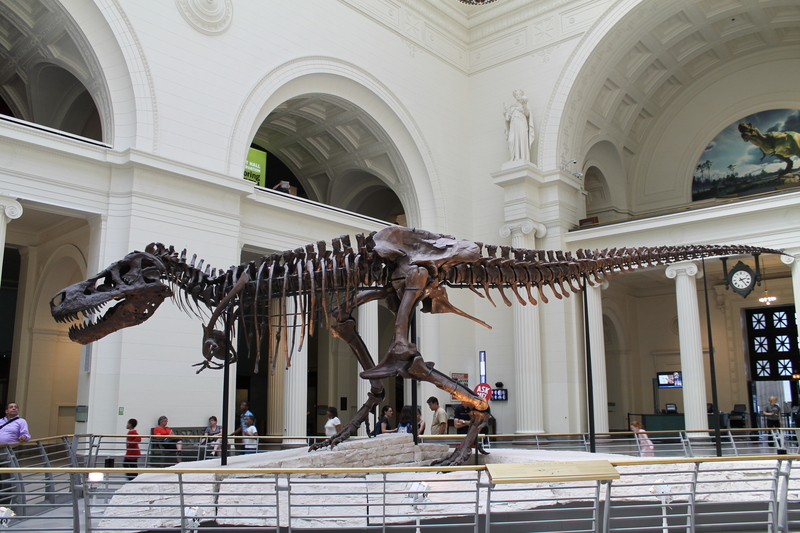 14 years ago, FMNH PR 2081, also known as Sue, became a star attraction for the Field Museum of Natural History and the city of Chicago at large. Later this month, another T. rex will unwittingly take on a similar role: on April 15th, MOR 555, an 80% complete Tyrannosaurus specimen discovered in Montana, will be dubbed “The Nation’s T. rex“ and entered into the Smithsonian National Museum of Natural History collection with considerable fanfare. Skull cast of MOR 555, soon to be “The Nation’s T. rex“, at the National Museum of Natural History. Photo by the author. This three part series is a look back at how the tyrant king has defined, and been defined by, the museum experience. Part 1 will cover the circumstances surrounding the creation of the iconic original Tyrannosaurus mount in New York, as well as its successor in Pittsburgh. Part 2 will explore the changing role of Tyrannosaurus in museums caused by a surge of new fossil finds and a revolution in our understanding of dinosaurs. Finally, Part 3 will conclude with a discussion of the positives and negatives of a modern world saturated in all things T. rex. 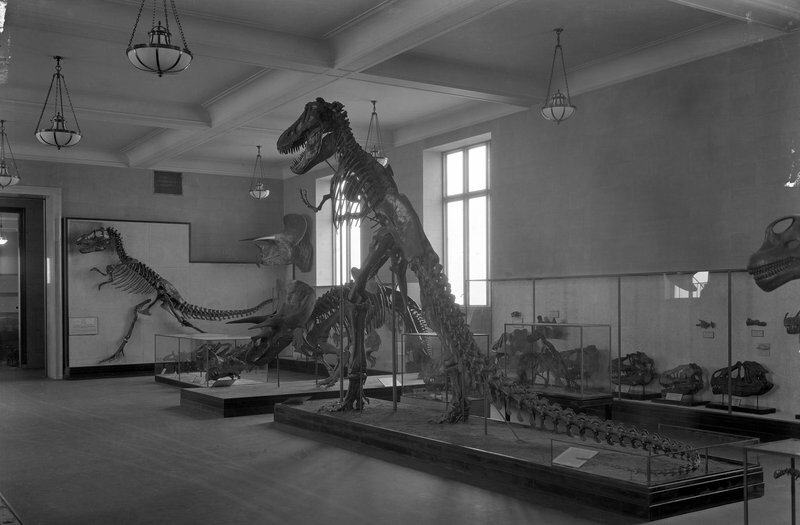 Between 1890 and 1910, the United States’ large urban natural history museums entered into a frenzied competition to find and display the largest and most spectacular dinosaur skeletons. Although the efforts of paleontologists O.C. Marsh and E.D. Cope in the late 19th century fleshed out the scientific understanding of Mesozoic reptiles, it was these turn-of-the-century museum displays that brought dinosaurs into the public sphere. Bankrolled by New York’s wealthy aristocrats and led by the ambitious mega-tool Henry Osborn, AMNH won the fossil race by most any measure. The New York museum completed the world’s first mounted skeleton of a sauropod dinosaur in 1905, and also left its Chicago and Pittsburgh competitors in the dust with the highest visitation rate and the most fossil mounts on display. Osborn’s goal was to establish AMNH as the global epicenter for paleontology research and education, and in 1905 he revealed his ace in the hole: two partial skeletons of giant meat-eating dinosaurs uncovered by fossil hunter Barnum Brown. In a deceptively brief paper in the Bulletin of the American Museum of Natural History, Osborn described the fossils from Wyoming and Montana, coining the names Dynamosaurus imperiosus and Tyrannosaurus rex (a follow-up paper in 1906 reclassified “Dynamosaurus” as a second Tyrannosaurus specimen). Fully aware of what a unique prize he had in his possession, Osborn wasted no time leveraging the fossils for academic glory (and additional funding from benefactors). He placed the unarticulated Tyrannosaurus fossils on display at AMNH shortly after his initial publication, and commissioned legendary artist Charles Knight to prepare a painting of the animal’s life appearance. In 1908, Brown collected a much more complete Tyrannosaurus specimen (AMNH 5027), with over 50% of the skeleton intact, including the first complete skull and a significant portion of the torso. With this specimen in hand, AMNH technician Adam Hermann and his team began work on a mounted Tyrannosaurus skeleton to join the Museum’s growing menagerie of mounted dinosaurs and prehistoric mammals. Inspired by the Museum’s collection of taxidermy mounts in dynamic habitat dioramas, and seeking to accentuate the spectacle of his reptilian monster, Osborn initially wanted to mount two Tyrannosaurus skeletons facing off over a dead hadrosaur. He even published a brief description complete with illustrations of the projected scene (shown below). However, the structural limitations inherent to securing heavy fossils to a steel armature, as well as the inadequate amount of Tyrannosaurus fossils available, made such a sensational display impossible to achieve. Model of unrealized T. rex showdown mount. Image from Osborn 1913. Instead, Hermann prepared a single Tyrannosaurus mount, combining the 1908 specimen with plaster casts of leg bones from the 1905 holotype. The original skull was impractically heavy, so a cast was used in its place. Finally, missing portions of the skeleton, including the arms, feet, and most of the tail, were sculpted by hand using bones from Allosaurus as reference. During the early 20th century, constructing fossil mounts was a relatively new art form, and while Hermann was one of the most talented and prolific mount-makers in the business, his techniques were somewhat unkind to the fossil material. Bolts were drilled directly into the fragile bones to secure them to the armature, and in some cases steel rods were tunneled right through the bones. Any fractures were sealed with plaster, and reconstructed portions were painted to be nearly indistinguishable from the original fossils. Like most of the early AMNH fossil mounts, preserving the integrity of the Tyrannosaurus bones was often secondary to aesthetic concerns like concealing the unsightly armature. AMNH Tyrannosaurus, ca. 1940. Photo courtesy of the AMNH Research Library. The completed Tyrannosaurus mount, a magnificent sculptural combination of bone, plaster, and steel, was unveiled in 1915 to stunned audiences. The December 3rd New York Times article was thick with hyperbole, declaring the dinosaur “the prize fighter of antiquity”, “the king of all kings in the domain of animal life,” “the absolute warlord of the earth” and “the most formidable fighting animal of which there is any record whatsoever” (and people say that today’s science journalism is sensationalist!). With its tooth-laden jaws agape and a long, dragging lizard tail extending its length to over 40 feet, the Tyrannosaurus was akin to a mythical dragon, an impossible monster from a primordial world. This dragon, however, was real, albeit safely dead for 66 million years. Today, we know that the original AMNH Tyrannosaurus mount was inaccurate in many ways. The upright, tail-dragging pose, which had been the most popular attitude for bipedal dinosaurs since Joseph Leidy’s 1868 presentation of Hadrosaurus, is now known to be incorrect. More complete Tyrannosaurus skeletons have revealed that the tail reconstructed by Osborn and Hermann was much too long. The Allosaurus-inspired sculpted feet were too robust, the legs (casted from the 1905 holotype), were too large compared to the rest of the body, and the hands had too many fingers (the mount was given proper two-fingered hands when it was moved in 1927). It would be misleading to presume that the prehistoric carnivore’s skeleton sprang from the ground exactly as it was presented, but it is equally problematic to reject it as a fake. There are many reasons to criticize Osborn’s leadership at AMNH, but he did not exhibit outright forgeries. The 1915 Tyrannosaurus mount was a solid representation of the best scientific data available at the time, presented in an evocative and compelling manner. The AMNH Tyrannosaurus mount was no less than an icon: for paleontology, for its host museum, and for the city of New York. The mount has been a New York attraction for longer than the Empire State Building, and for almost 30 years, AMNH was the only place in the world where visitors could see a T. rex in person. In 1918, Tyrannosaurus would make its first Hollywood appearance in the short film The Ghost of Slumber Mountain. This star turn was followed by roles in 1925’s The Lost World and 1933’s King Kong, firmly establishing the tyrant king’s celebrity status. It is noteworthy that special effects artist Willis O’Brian and model maker Marcel Delgado copied the proportions and posture of the AMNH display exactly when creating the dinosaurs for each of these films. The filmmakers apparently took no artistic liberties, recreating Tyrannosaurus precisely how the nation’s top scientists had reconstructed it in the museum. 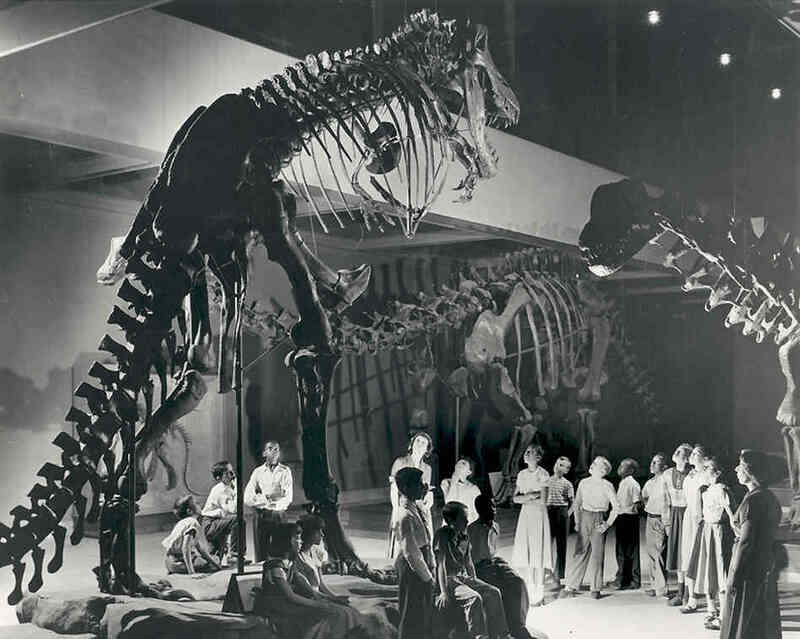 In 1941, AMNH ended it’s Tyrannosaurus monopoly and sold the incomplete type specimen (the partial skeleton described in Osborn’s 1905 publication) to Pittsburgh’s Carnegie Museum of Natural History. While it is sometimes reported that this transfer took place to keep the valuable fossils out of harm’s way during World War II (e.g. Larson 2008), the deal was apparently underway well before the United States became involved in the war. Having paid an astounding $100,000 ($1.7 million in today’s dollars) for the fossils, CMNH staff wasted no time in assembling a mount of their own. The Tyrannosaurus holotype only included only about 15% of the skeleton, so most of Pittsburgh mount had to be made from casts and sculpted elements. Somewhat pointlessly, the skull fragments included with the specimen were buried inside a plaster skull replica, making them inaccessible to researchers for several decades. Completed in less than a year, the CMNH Tyrannosaurus was given an upright, tail-dragging posture very much like its AMNH predecessor. The mid-20th century is sometimes called the “quiet phase” in vertebrate paleontology. After enjoying public fame and generous federal support during the late 1800s, paleontology as a discipline was largely marginalized when experiment-driven “hard” sciences like physics and molecular biology rose to prominence. By the 1950s and 60s, the comparably small number of researchers studying ancient life were chiefly concerned with theoretical models for quantifying trends in evolution. Although the aging dinosaur displays at American museums remained popular with the public, these animals were perceived as evolutionary dead-ends, of little interest to the majority of scientists. Between 1908 (when Brown found the iconic AMNH Tyrannosaurus skeleton) and 1980, only four largely incomplete Tyrannosaurus specimens were found, and no new mounts of this species were built. Continue to Displaying the Tyrant King Part 2. Glut, D. 2008. “Tyrannosaurus rex: A century of celebrity.” Tyrannosaurus rex, The Tyrant King. Larson, Peter and Carpenter, Kenneth, eds. Bloomington, IN: Indiana University Press. Hermann, A. 1909. “Modern Laboratory Methods in Vertebrate Paleontology.” Bulletin of the American Museum of Natural History 21:283-331. Larson, N. 2008. “One Hundred Years of Tyrannosaurus rex: The Skeletons.” Tyrannosaurus rex, The Tyrant King. Larson, Peter and Carpenter, Kenneth, eds. Bloomington, IN: Indiana University Press. “Mining for Mammoths in the Badlands: How Tyrannosaurus Rex Was Dug Out of His 8,000,000 Year old Tomb,” The New York Times, December 3, 1905, page SM1. Naish, D. 2009. 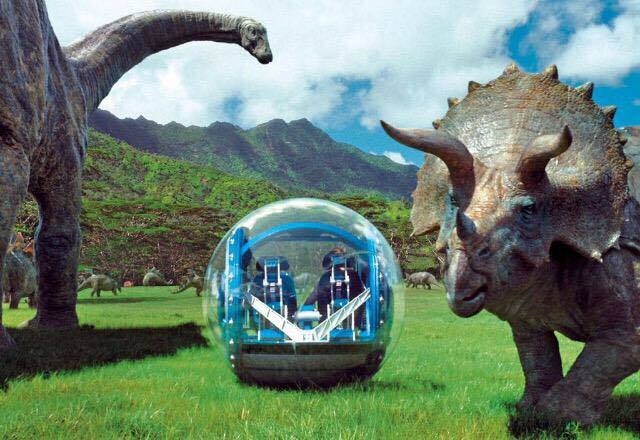 The Great Dinosaur Discoveries. Berkeley, CA: University of California Press. Osborn, H.F. 1906. “Tyrannosaurus, Upper Cretaceous Carnivorous Dinosaur.” Bulletin of the American Museum of Natural History 22:281-296. Osborn, H.F. 1913. “Tyrannosaurus, Restoration and Model of the Skeleton.” Bulletin of the American Museum of Natural History 32:9-92. Rainger, Ronald 1991. “An Agenda for Antiquity: Henry Fairfield Osborn and Vertebrate Paleontology at the American Museum of Natural History, 1890-1935. Tuscaloosa, Alabama. University of Alabama Press. Wesihampel, D.B. and White, Nadine M. 2003.The Dinosaur Papers: 1676-1906. Washington, DC: Smithsonian Books.